Since I became a homeowner several years ago, I always wanted to build a sauna. I blame it on being raised in Michigan's Upper Peninsula where there are many people of Finnish descent. 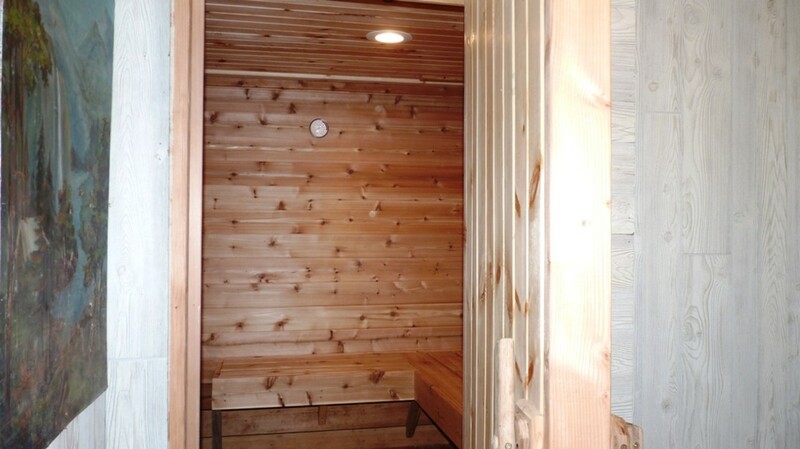 A sauna is a small hot room (140 F to 200 F) where you go to sweat. It promotes relaxation and encourages good health. I’ve seen a few inside of homes and a few outside of homes, as well as some in spas and health clubs. 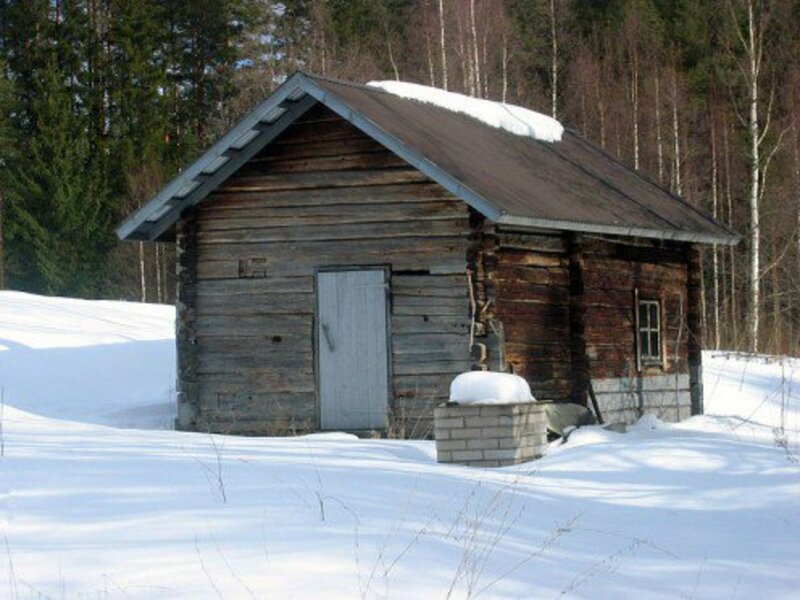 A popular activity, though somewhat peculiar, is to heat yourself in a sauna and then go roll in snow or plunge yourself into cool water. This can be very—shall I say—invigorating. Outdoor saunas are rooted in tradition. 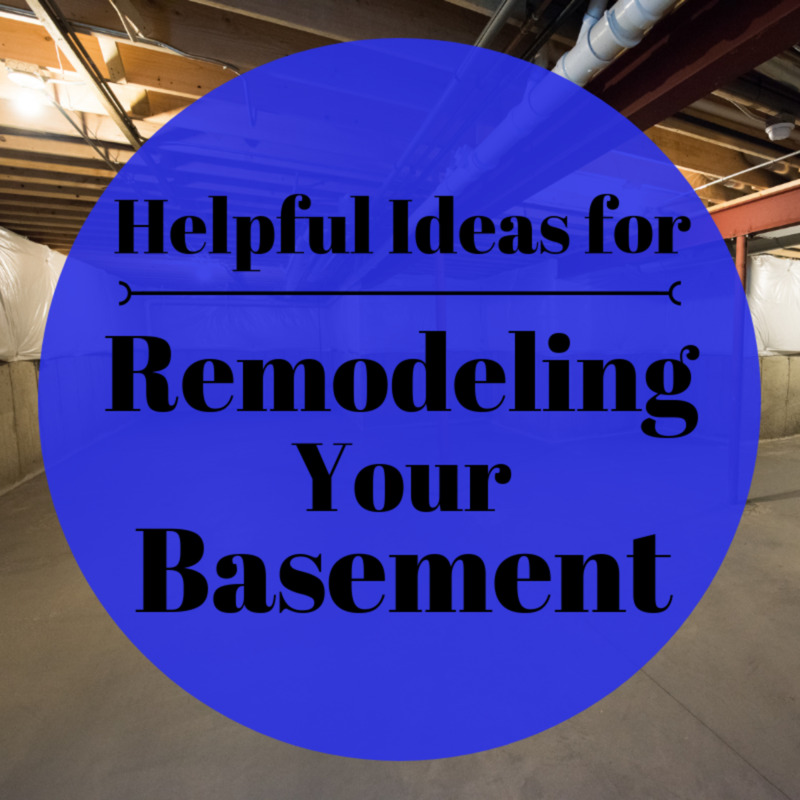 I thought of purchasing a kit with an electric heater and putting the sauna in the basement. I also thought of building a room on my deck near the house. 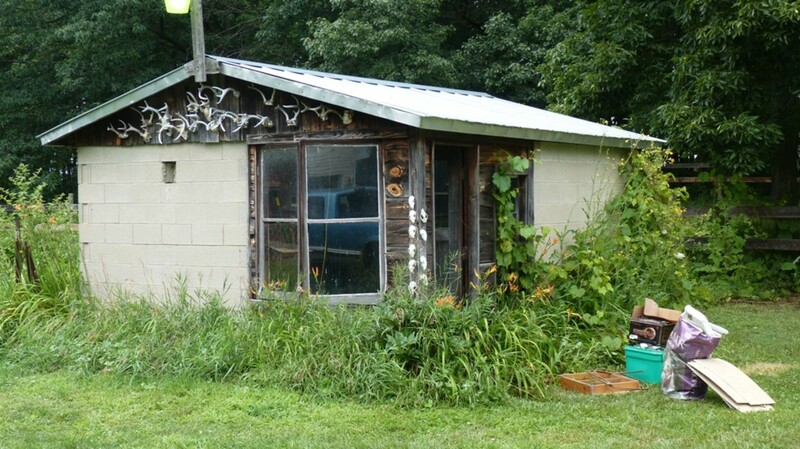 I happened to have an old, concrete block outbuilding which was used to store nothing but junk. It was not too far from the house. Voila, the perfect location for a sauna! I also had an old iron fireplace insert sitting around just slowly rusting. Voila, a perfect sauna heater! Finally, it was decided. After thoughts of my own sauna lurked around in the dark recesses of my twisted mind for years, an outdoor wood-fired sauna is what I would build. First steps involved clearing the structure of debris. 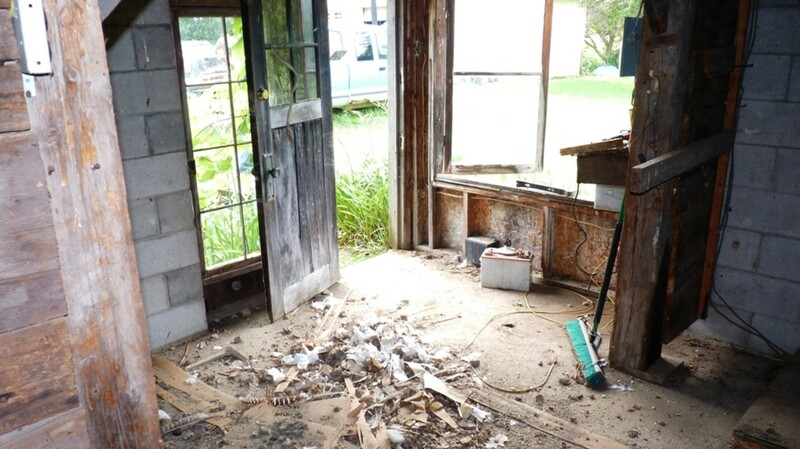 The first step was to clean the outbuilding and throw away any unusable junk that had accumulated for the past several years. There were vines growing into the building from an uncovered eve and mud-dauber wasp nests throughout. 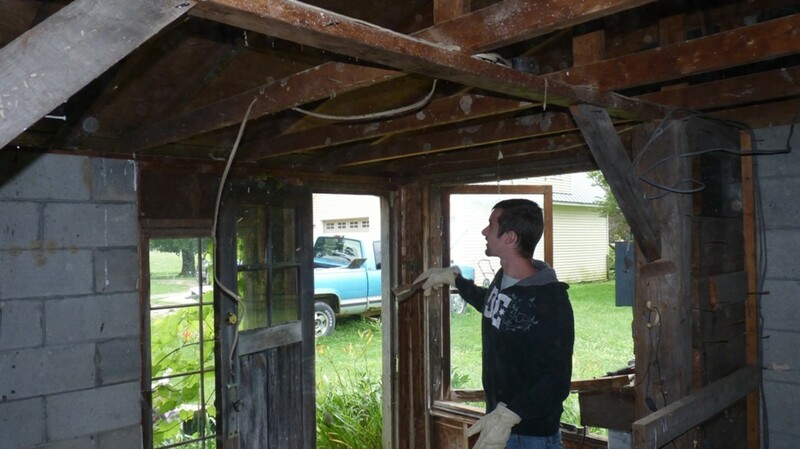 One half of the ceiling was covered with paneling, which when removed, sent a shower of dirt and assorted debris down onto me. After removing hundreds of nails, I was ready to measure and mark the space. Over the years, I refined the plans and made several hand drawings and CAD drawings as I mulled over the perfect sauna project. 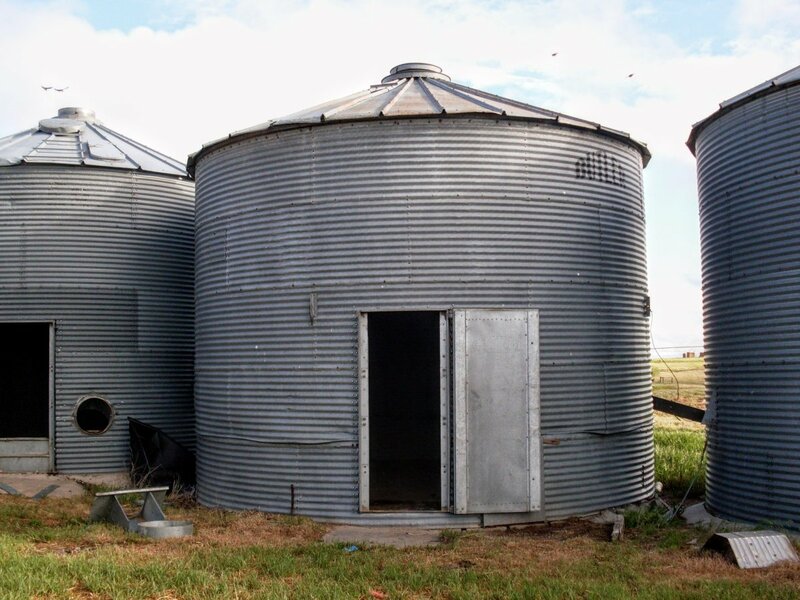 When I decided to use the outbuilding I had sketched, my plans began to solidify my design. As usual, once I discussed the plans with my wife, they changed. 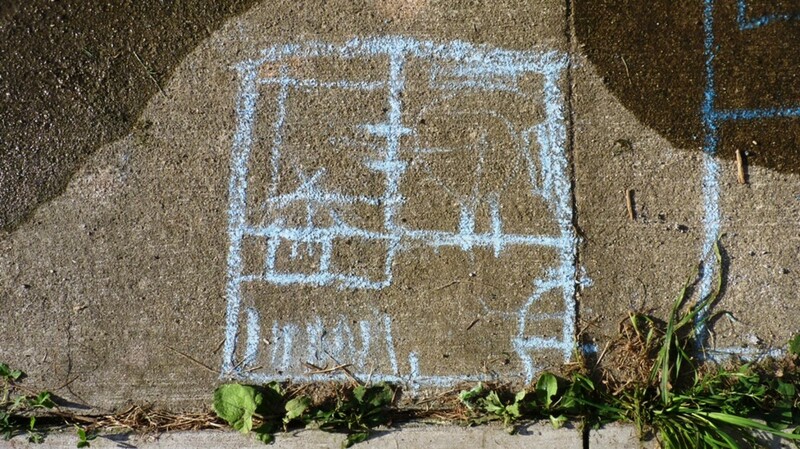 She is not a CAD wizard, so she sketched her version in chalk on the driveway. 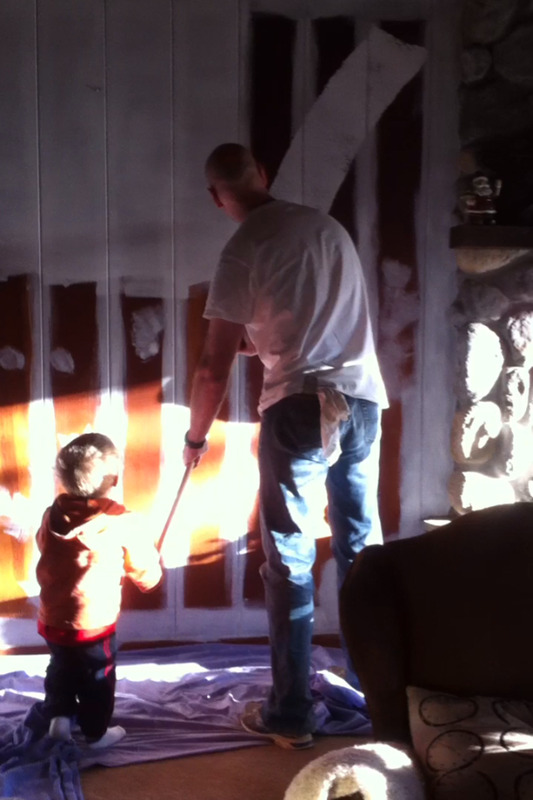 Shortly after, I began working on the sauna interior according to my wife's chalk sketch. 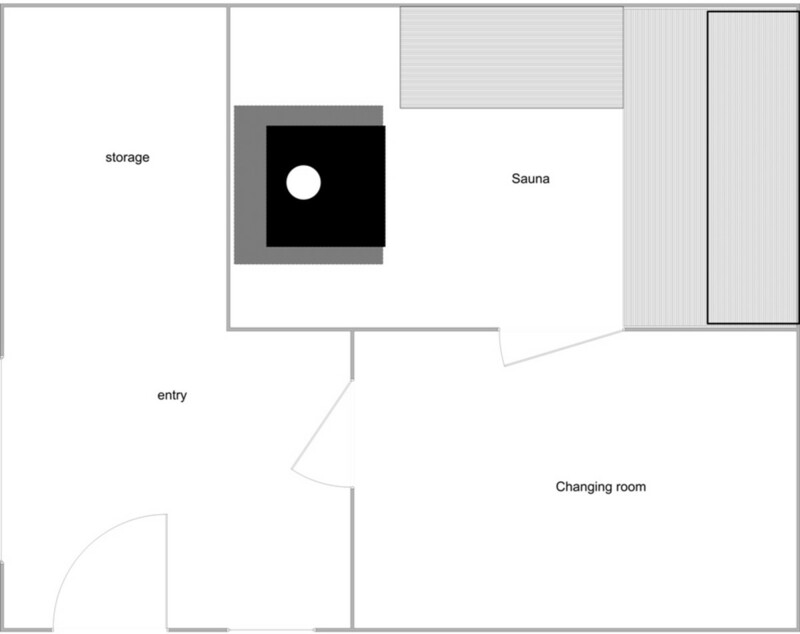 We decided to divide the interior space into three rooms: the sauna, a changing room, and an entry/storage area. 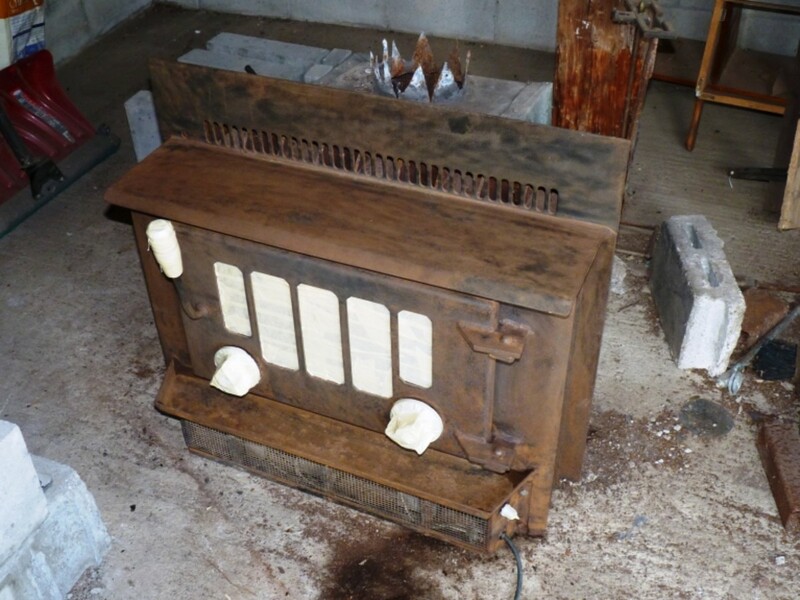 Salvaging a rusted iron fireplace took some work. Next, I constructed a hearth to house the iron fireplace insert. After much contemplation, I located its position in the sauna room space and decided to run the chimney straight up through the roof. 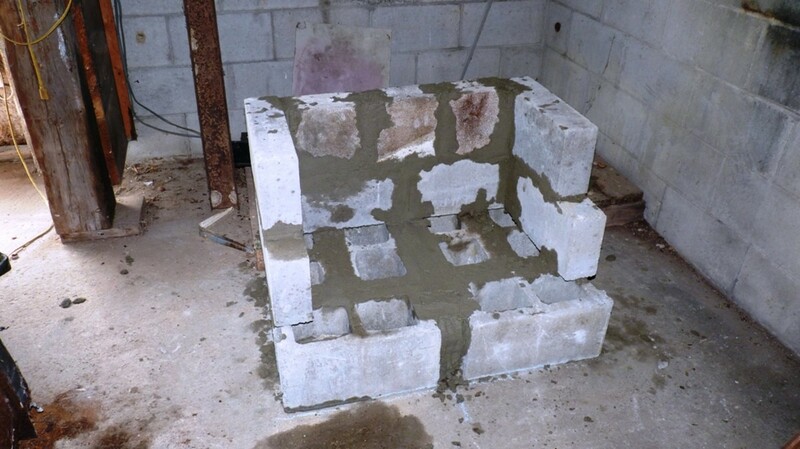 To construct the hearth, I used concrete blocks (which I’ve always called cinder blocks, perhaps incorrectly) as the base. The hearth walls and top were constructed of concrete bricks. It took more blocks, bricks, and mortar than I imagined. I used angle iron pieces I had cut from an old bed frame along with pieces of scrap sheet metal to span the walls and hold the bricks in place for the top. All was held together with masonry cement. 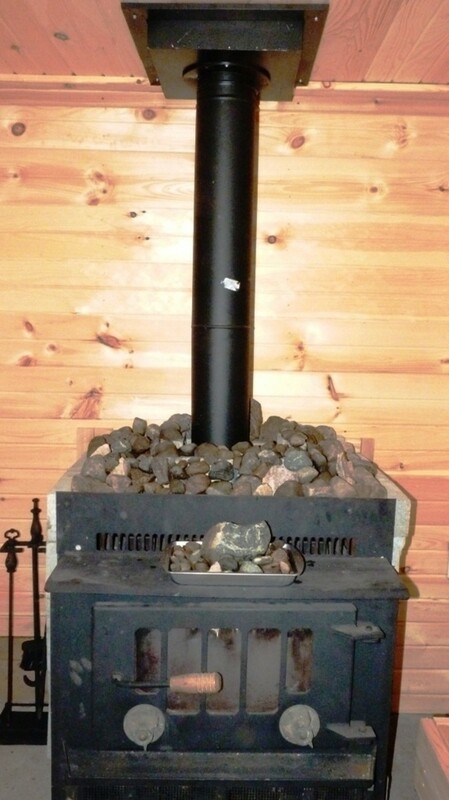 In a standard design, a sauna stove usually heats rocks onto which water can be dripped to add steam. 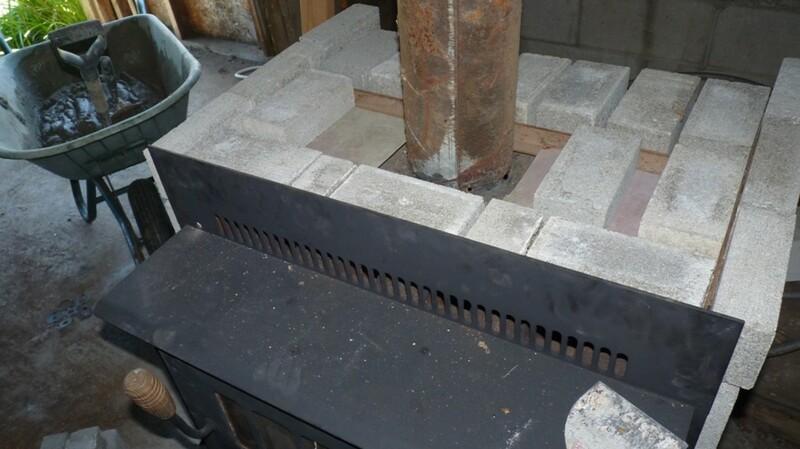 Since the top was enclosed with brick and the stove was a steel enclosure itself, I didn't anticipate much heat transfer to the rocks. I added some anyway for decoration. If I wanted some steam, I could place a pan of small rocks on the top steel ledge of the stove where the blower outlet holes were located. 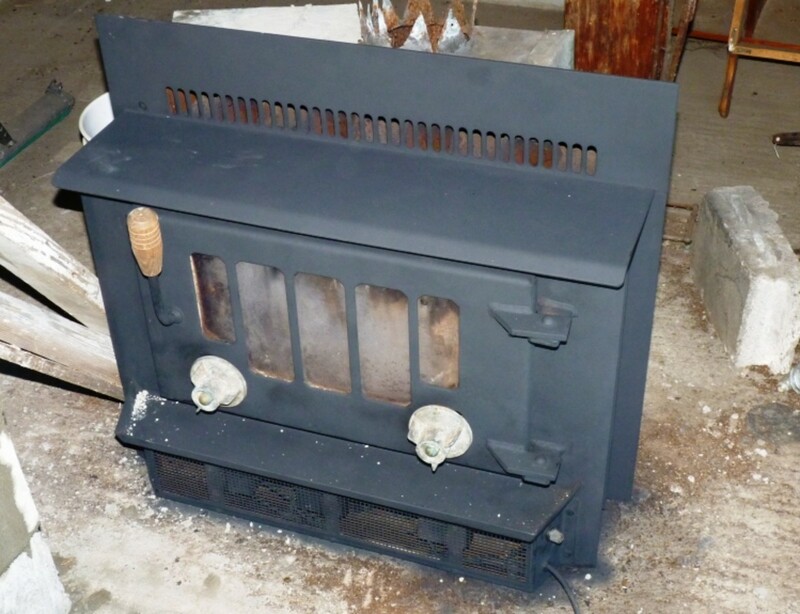 Before installing the heavy 300+ pound insert, it was repainted with flat black high-temperature wood stove paint from Home Depot. 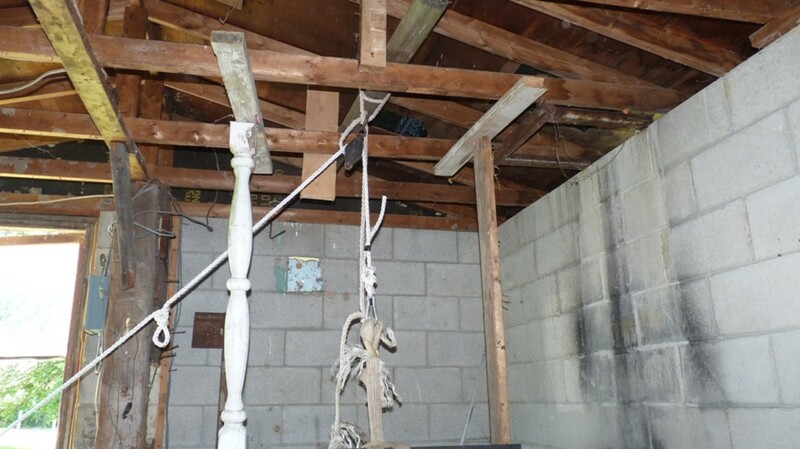 Then, it was positioned in front of the hearth before the top bricks were placed and hoisted using a come-along and a nylon tow strap draped over a post in the rafters. It slid right into place with only 1/4" clearance on either side. (A bit of advice here: Measure carefully several times before building the hearth.) The stove protruded somewhat, and the bottom was designed to be set on a ledge of the fireplace. This threw the balance out slightly and made the stove want to tip outward, so I placed a block under the bottom front for it to rest on. Drafted order summary from woodlanddirect.com. Once I decided to run the chimney straight up through the roof and not through the side wall, I needed to find chimney components. 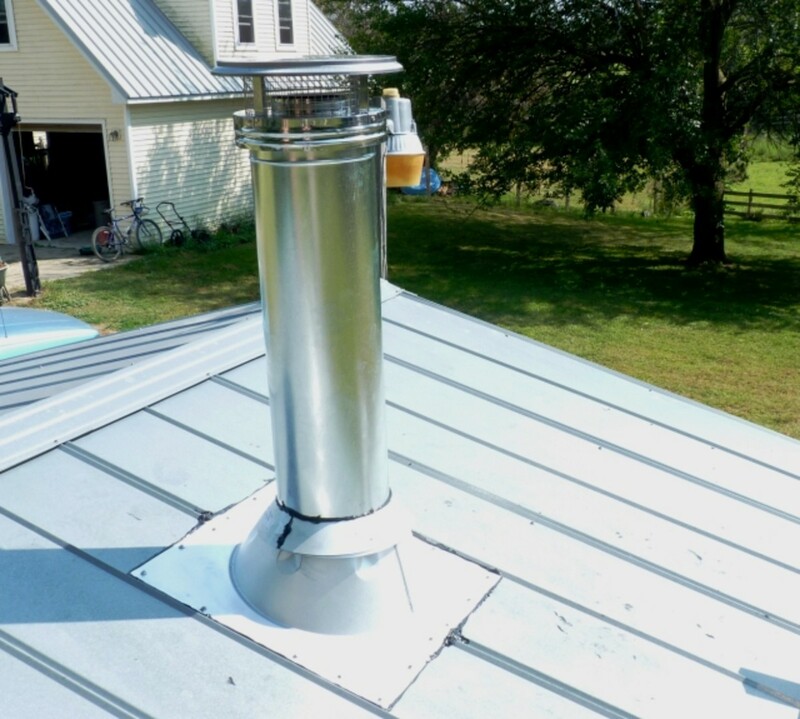 I was looking for a metal, double wall chimney system to be fire safe and to minimize the clearances I needed. 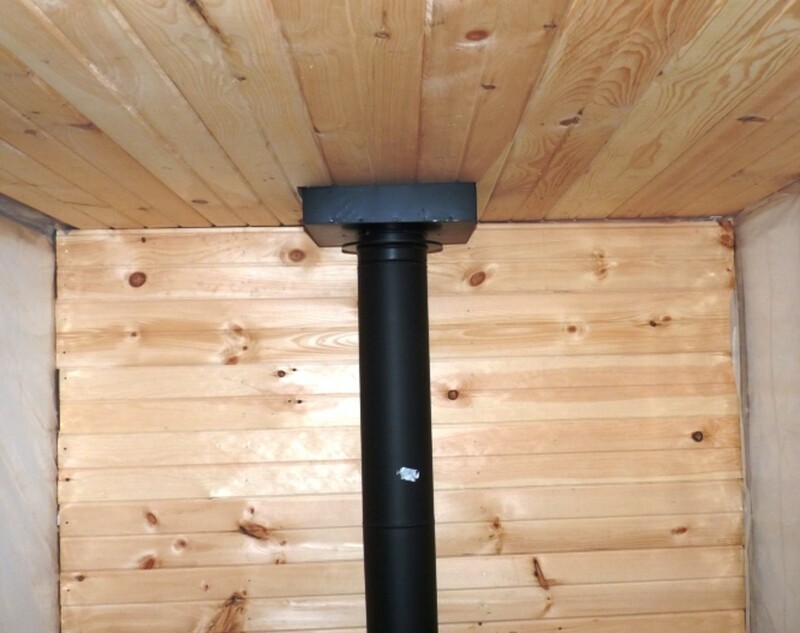 I figured I could use single wall stovepipe up to the ceiling of the sauna, then double wall the rest of the way. I began an online search and settled on a company called woodlanddirect.com. They seemed to have a very large selection of components. 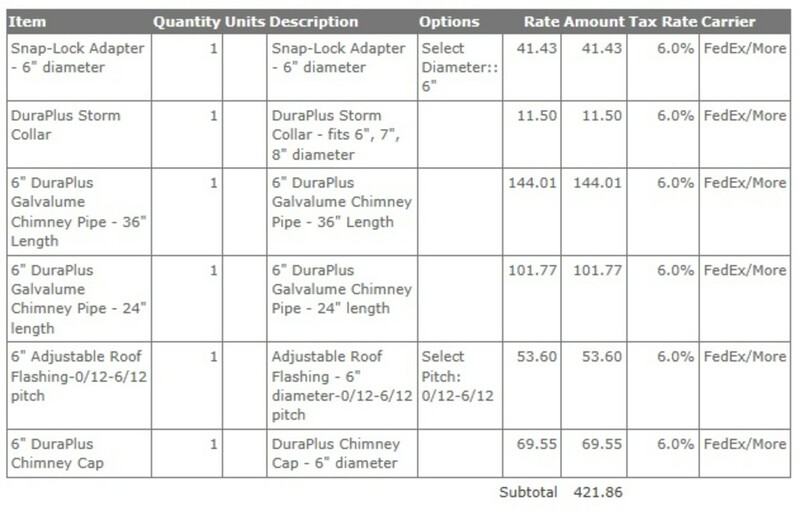 I used their chimney design wizard to specify the components I needed, but when the price tag approached $800, I thought I could order “a la carte” and save some money. When the parts arrived and I tried to test fit them together, I found that nothing worked. I called the company and timidly explained that I didn’t know what I was doing and needed help. The technical sales person explained that nothing I had ordered would fit together. 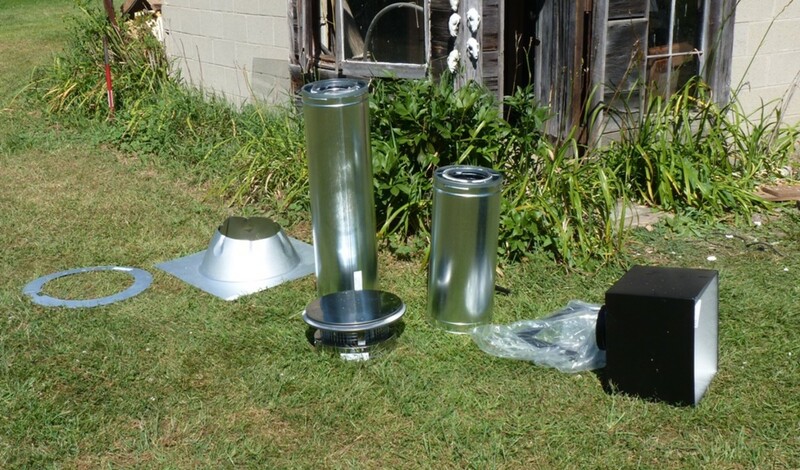 They were very cooperative with the return and helped me order the correct chimney components. I ended up at about $100 more than my first order, but still way less than $800. 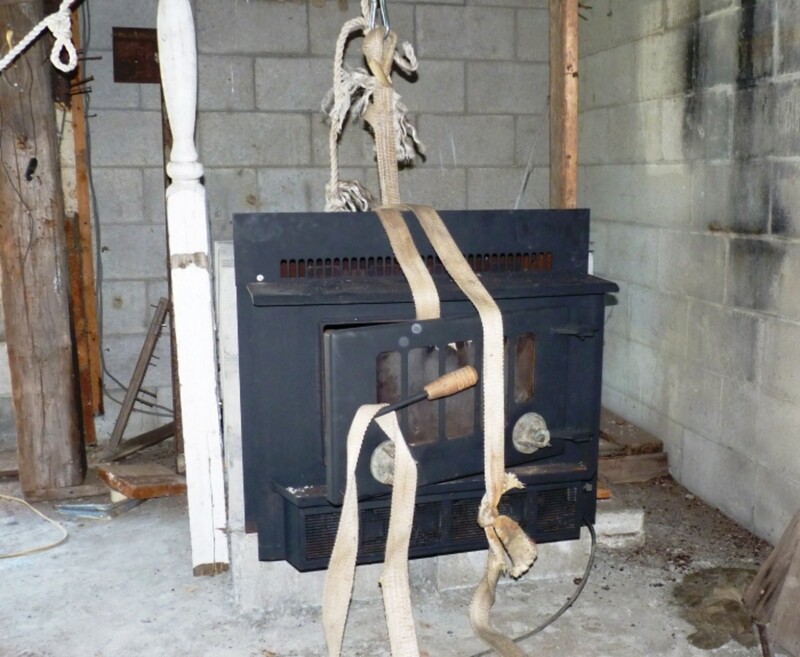 It is recommended that the chimney terminates at least 2 feet above any obstacles. 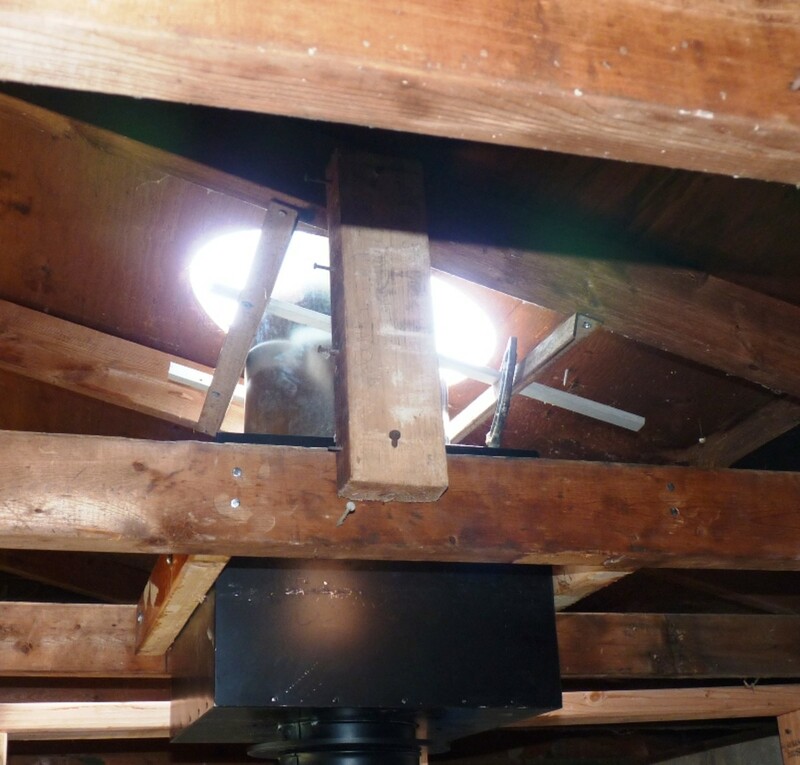 I hung a plumb bob from the ceiling over the outlet of the stove and marked the inside of the roof to cut the clearance hole. I “dry fitted” everything together from the stove to the chimney cap, then secured it with extra bracing between the rafters. This building had a sheet metal roof and I thought I could flatten the ridges of the sheet metal with a big hammer and then place the chimney flashing over the top. That did not work. Instead, I cut the flashing to fit between the ridges along its sides and then formed it over the roofing ridges along the top and bottom. I applied a very generous amount of silicone roofing cement. Just to be sure the stove and chimney were really doing the job and to check for smoke leaks, I started a test fire with a large wad of newspaper. Smoke came from the top of the chimney and nowhere else. 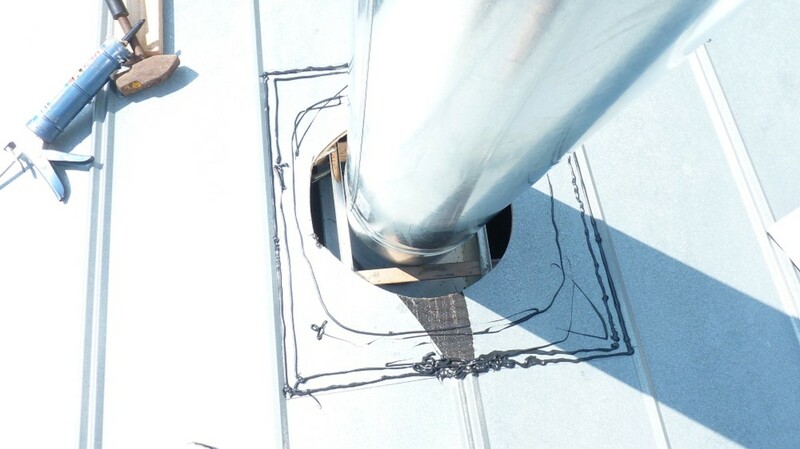 It is recommended that the chimney terminates at least 2 feet above any obstacles, including the roof peak. I know that if the chimney is not high enough, it will not draw well. My chimney is about 3 feet above the roof peak. In hindsight, I probably should have run a stress test with a full-blown fire in the stove. 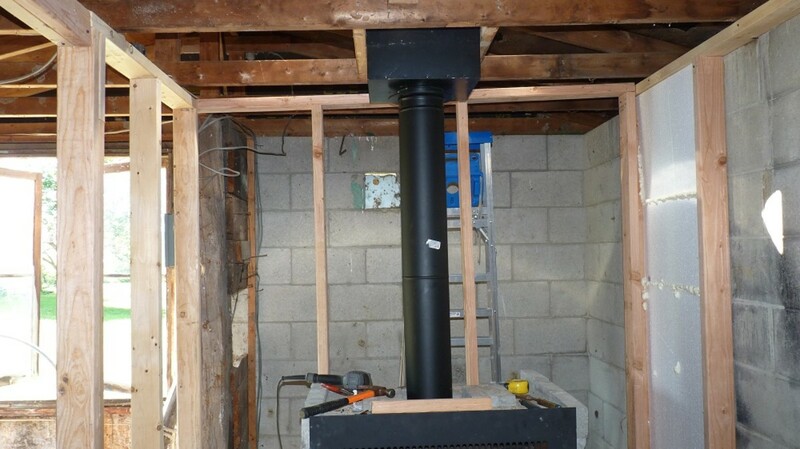 I started framing before I installed the chimney and completed the task once the chimney was installed. 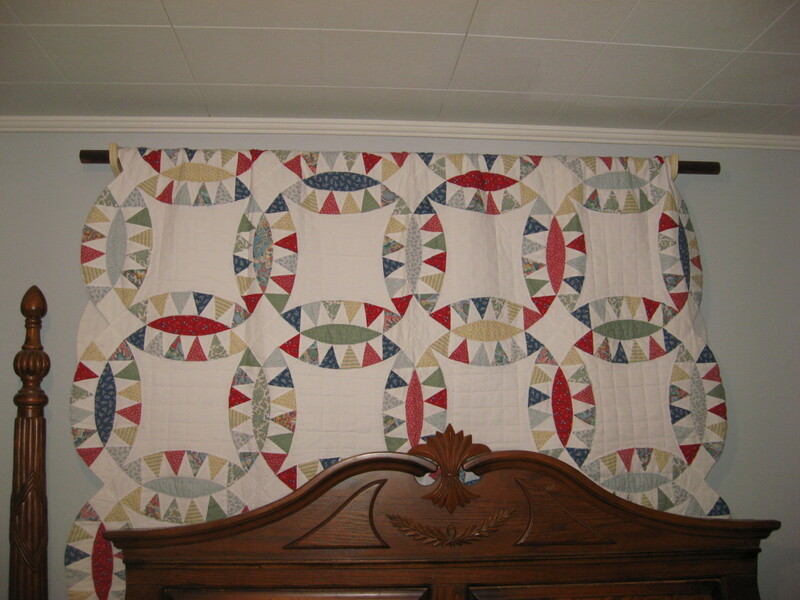 Since I knew that the paneling would not be pieced together and would span the entire length of each wall, I was not too strict with stud spacing—they were placed on 24" centers. Between each stud, I placed 2" thick Styrofoam panels (approx R-10 value) and sealed the gaps with Great Stuff expanding foam. 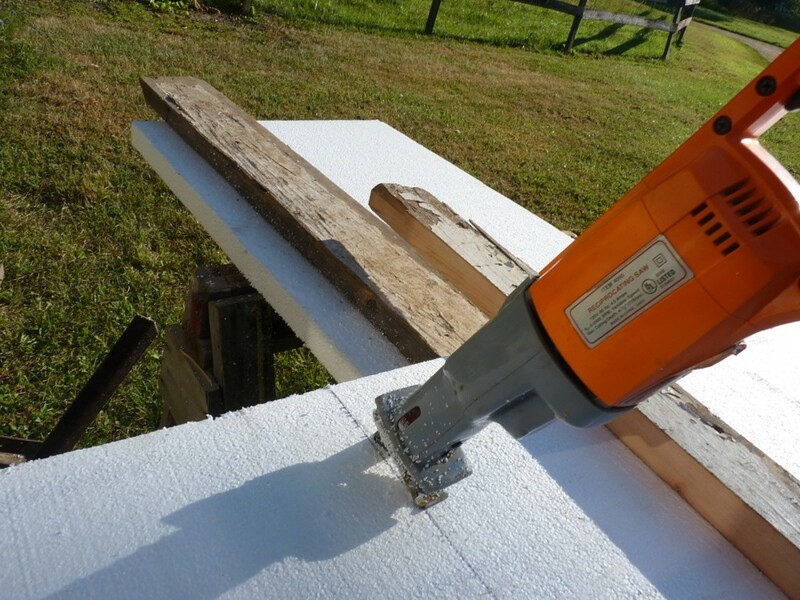 I found that using a reciprocating saw with a fine-tooth blade works well for cutting the panels. I wondered a little about whether the "R" value would suffice. The building is made of 9" thick cement block walls, so I left about a 1" air gap between the insulation and the block; the paneling is 3/4" thick cedar. All of this adds some extra insulation. The stove is oversized, almost Binford-sized, so I didn't anticipate a lack of heat. I did find, due to my lack of carpentry experience, that I needed to add a few strips of particle board inside the 2x4s at the corners where the walls met. 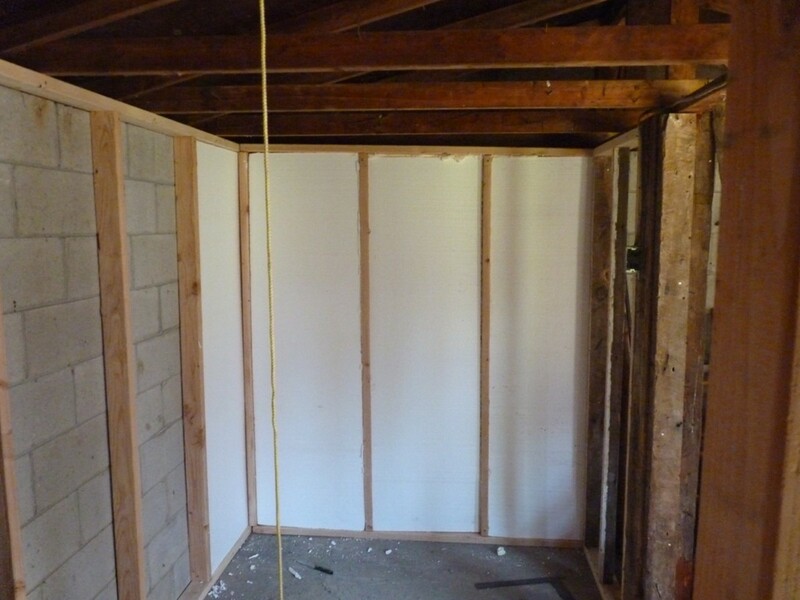 One wall had a place to nail the end of the paneling and the other perpendicular wall did not. It all worked out. I added a recessed LED ceiling light in the sauna room, a cheap ceiling fixture in the changing room, and an even cheaper ceiling fixture in the entry. I had to move the breaker box from what is now the entry into the new storage area. There were two large, wooden posts (approx. 8"x8") that partially supported the span of the roof trusses. They didn’t really help that much to support the structure since they were just wedged in place and held with a few nails through a truss. I moved one of them to the storage area; the breaker box was mounted on it. 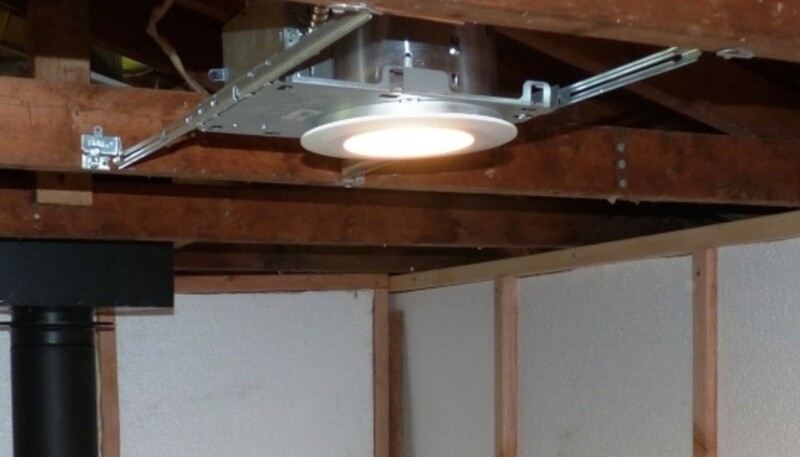 I added a recessed LED ceiling light in the sauna room, a cheap ceiling fixture in the changing room, and an even cheaper ceiling fixture in the entry. Of course, I had to add switches for each light. 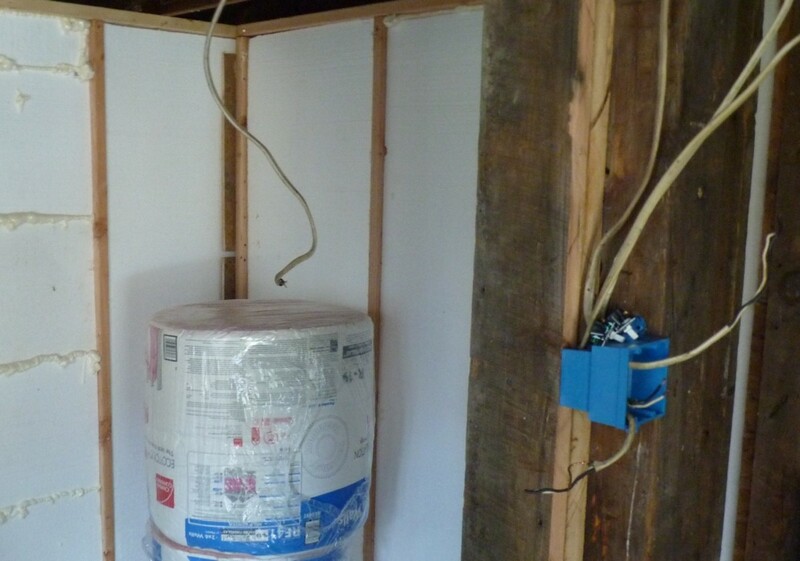 I also wired one electrical outlet in the sauna room (for the blower on the stove) and one in the changing room. At the time of this writing, the changing room light fixture was not installed since the ceiling paneling was not attached yet. I added paper-backed fiberglass insulation to the ceiling. 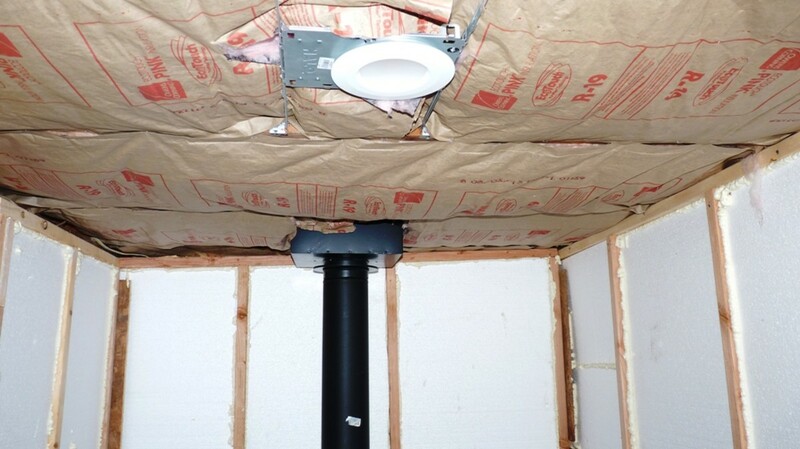 The next step was to insulate the ceiling with paper-backed fiberglass with an R-19 value. 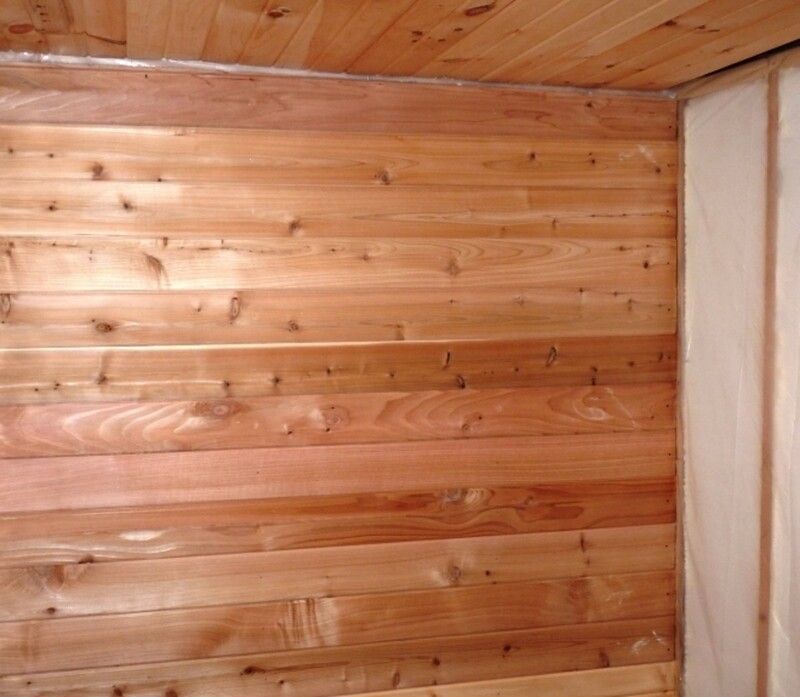 Two 39' rolls were enough to insulate the ceiling of the sauna room and the changing room. I left the entry and storage area ceiling uninsulated. 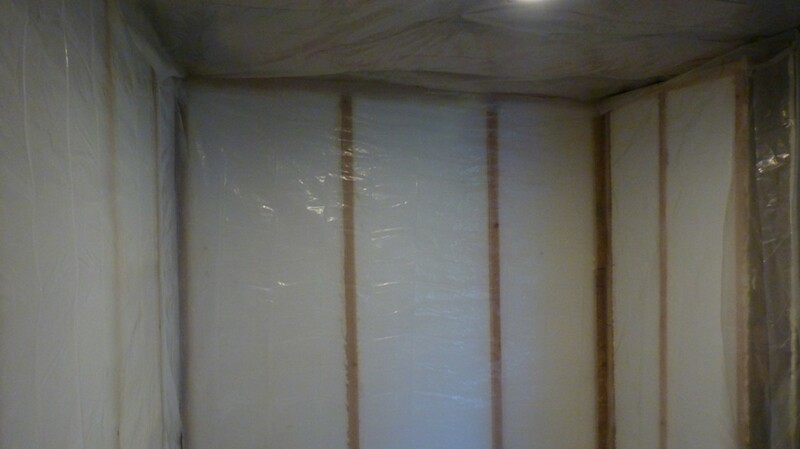 I placed a vapor barrier on the ceiling and walls. 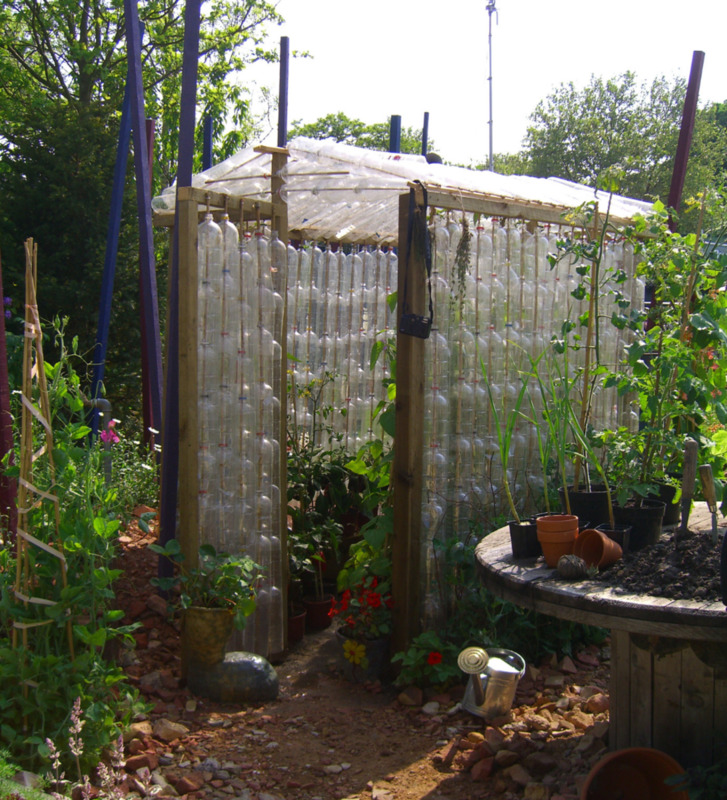 (It was simply one roll of 4 Mil plastic sheeting.) I cut it into wall-sized sections to make it more manageable during stapling. These steps went fairly quickly, but it would have been even quicker if I had help to hold the insulation or plastic in place while stapling. As it usually goes with my projects, help is somehow never available. I used a combination of cedar and pine for the interior. 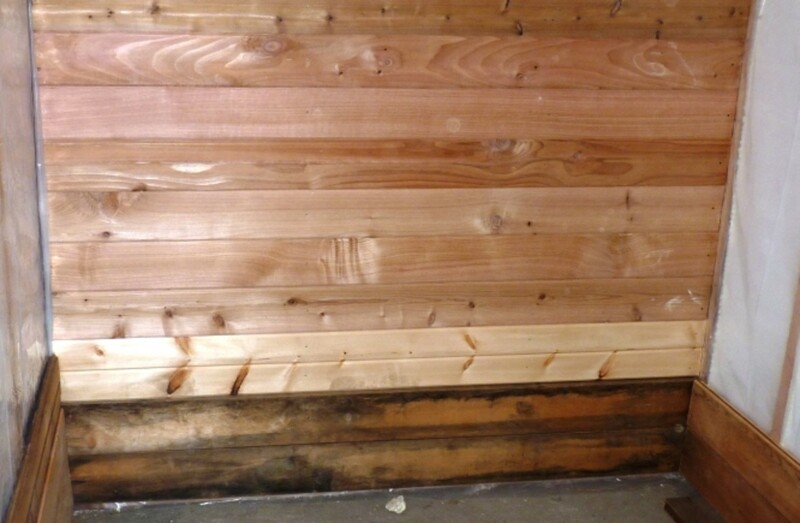 The walls are covered with 6"-wide Western red cedar house siding, again from Menards. I had to dig for a while through the stock of boards to find ones that were suitable. All the paneling was attached with galvanized finishing nails except in the places that were hard to hammer where I used finishing drywall screws. 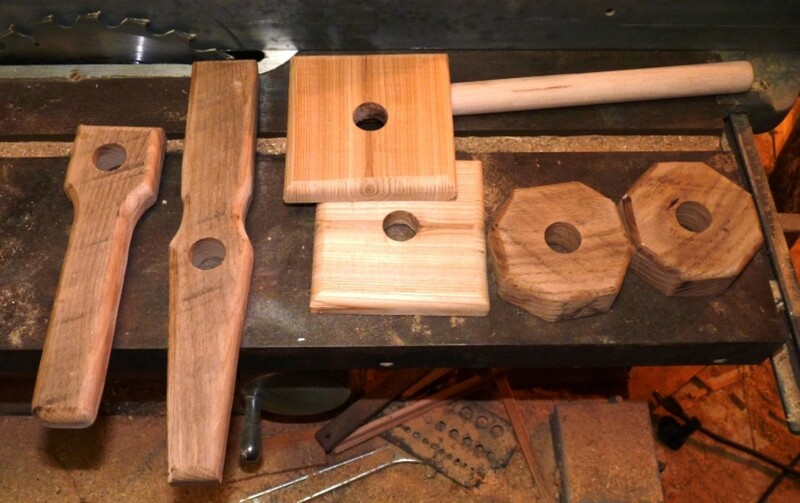 At each "wall-to-wall" and "wall-to-ceiling" intersection, I attached trim pieces made from either pine or cedar. Most of the trim was attached with finishing drywall screws. To minimize the cost of cedar, I used some 5/4 scrap lumber in the area underneath where the benches would be placed. I bought this wood at a garage sale for $5. The sauna needs to be vented or else the fire will deplete all of the oxygen. 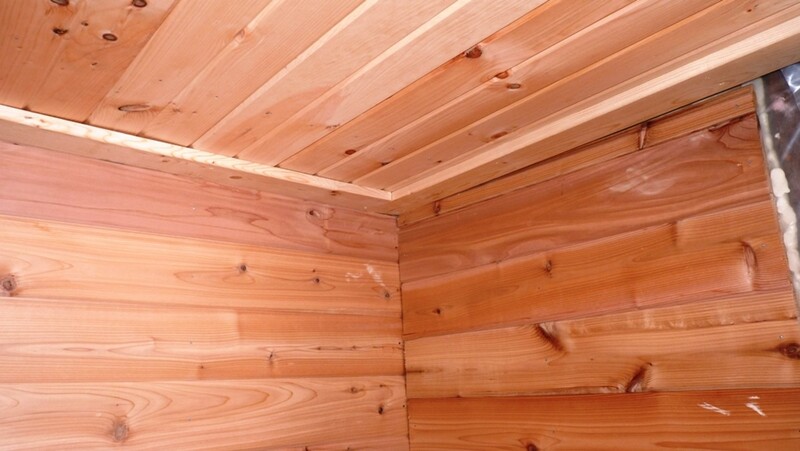 The sauna room needs to be vented, especially if a wood heater is used, otherwise, the fire would eventually burn off most of the oxygen in the sealed room and starve itself. (Not to mention the effects it could have on the bathers.) I cut a 6"x12" slot in the front wall near the floor at a corner, and another slot in the ceiling diagonal from the floor vent. Each slot was covered with a piece of scrap wood with holes cut with a 1/2" Forstner bit. 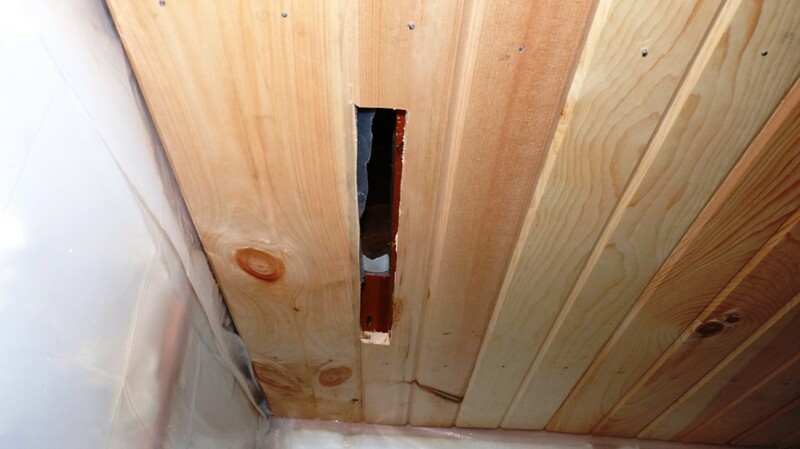 The holes were countersunk and the boards were attached with screws. 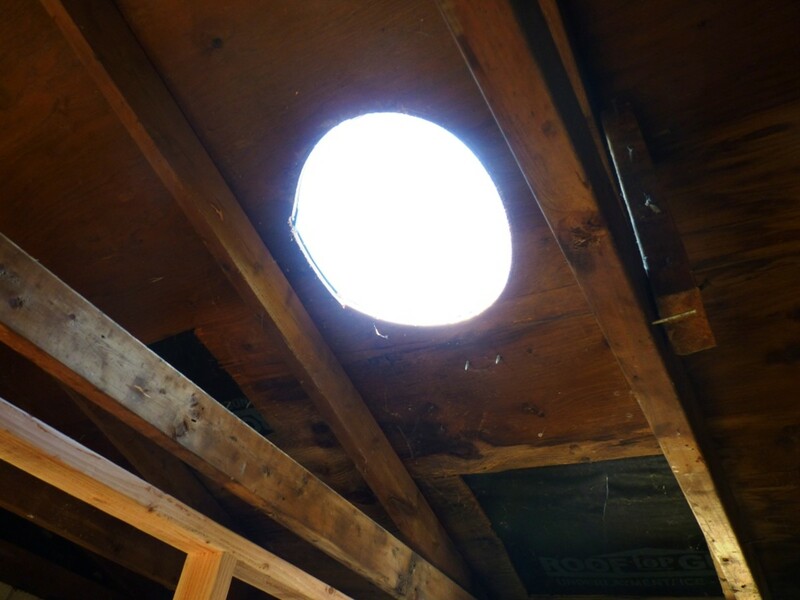 The ceiling vented into the attic and I figured that the clearance hole in the roof for the stove pipe would vent sufficiently to the outside. When constructing the benches, I wanted lower and upper platforms. When constructing the benches, I wanted lower and upper platforms. I decided to make an L-shape along the back wall furthest from the stove. There was really only room for one upper and lower platform along the back wall and a lower platform along the side wall. 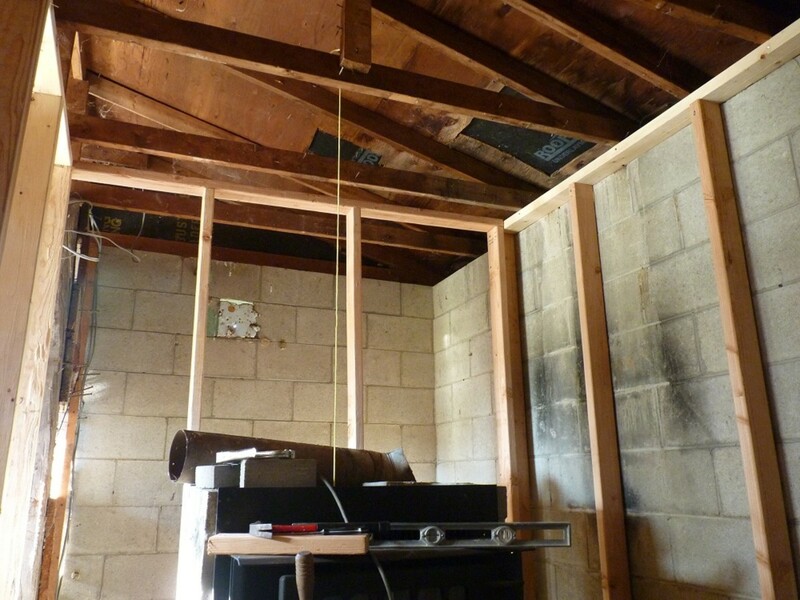 The lower bench is 18" from the floor and the upper bench needed 42" of clearance to the ceiling. (These dimensions are reflected in a home improvement book on spas and saunas that I picked up from the book rack at Home Depot years ago.) I would only have had 40" of clearance to the ceiling if I made the upper bench 17" above the lower bench. 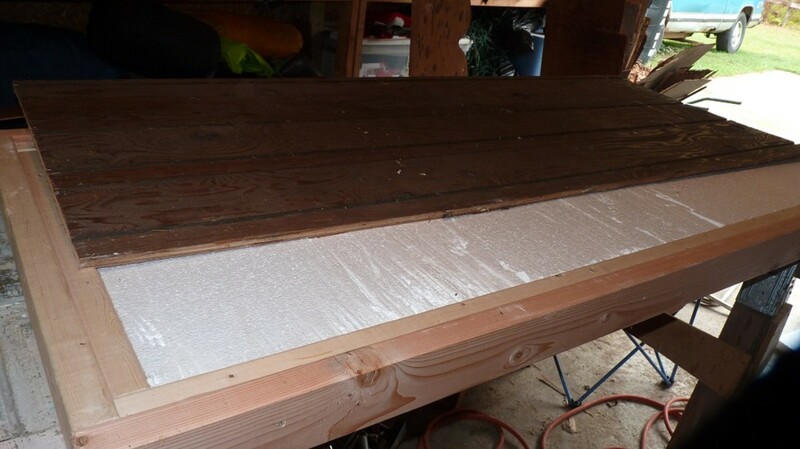 The upper is 29" wide, the lower is 36" wide, and both are 6' long; the bench along the side wall is 18" wide. This is just how the dimensions worked out. 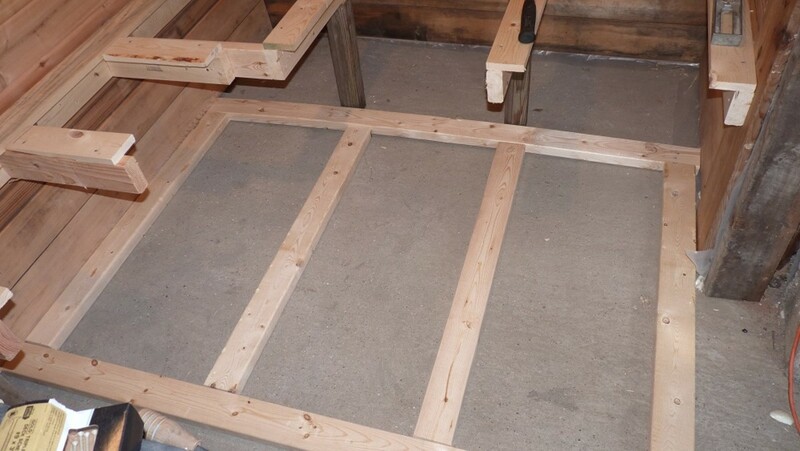 I first constructed frames for the benches from pine 2x4s. 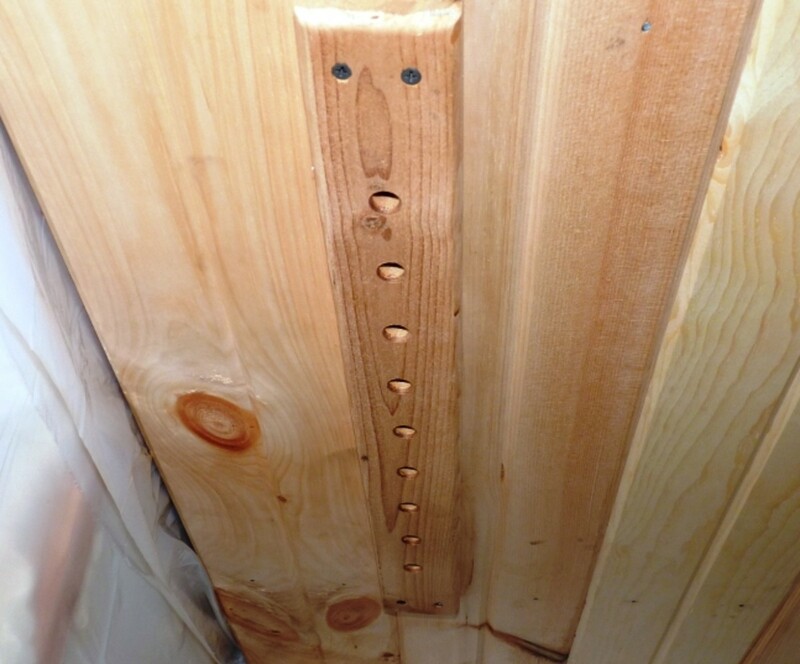 The part of the frame against the walls was attached through the paneling to the studs with a special 4-1/2 flat headed lag screw. 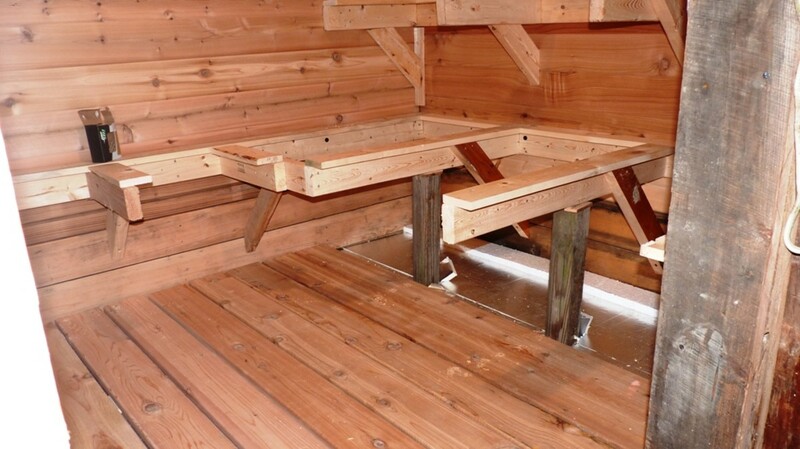 The lower benches had post legs for support and angle bracing also attached to the studs. The upper bench just used angle bracing to allow room underneath. The benches are made from 5/4 cedar deck planking and roughly spaced 1/2" apart. I cut and placed all the planks first without attaching them, then I adjusted the spacing to fill the frames and marked their locations. The front part of each frame where your legs would hang over was also made of cedar deck planking. On top of each part of the bench frames, I nailed 1x4 pine boards and drilled 2 clearance holes in each where the planking rested. Then, I screwed the planking to the boards from underneath. This took an entire weekend to complete, but I think they turned out okay. 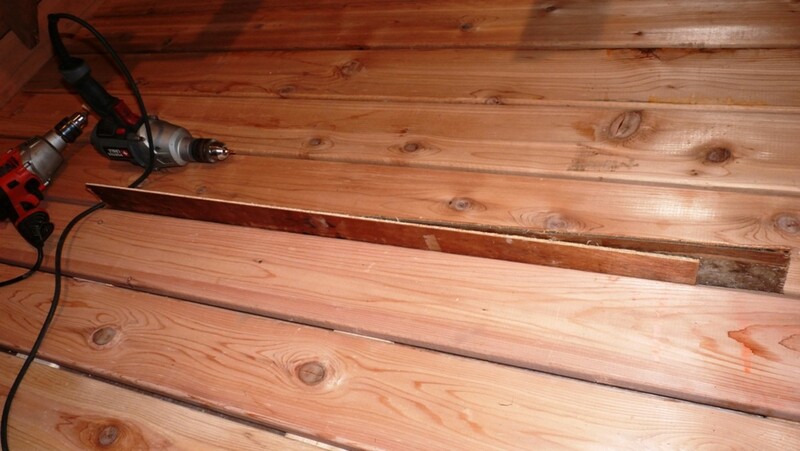 I decided to build a wooden platform floor in the sauna room. I left exposed concrete around the wood stove. The floor in my outbuilding was concrete. 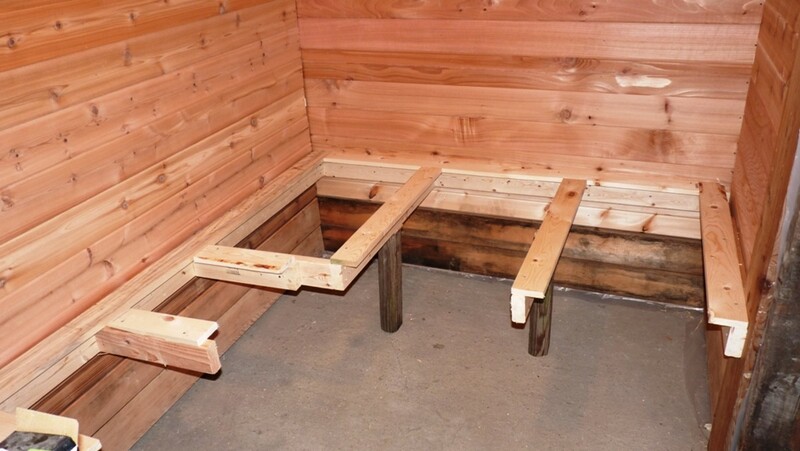 I decided to only build a wooden platform floor in the sauna room under and in front of the bench area and leave exposed concrete around the wood stove. The platform did not extend all the way to the wall under the widest bench. 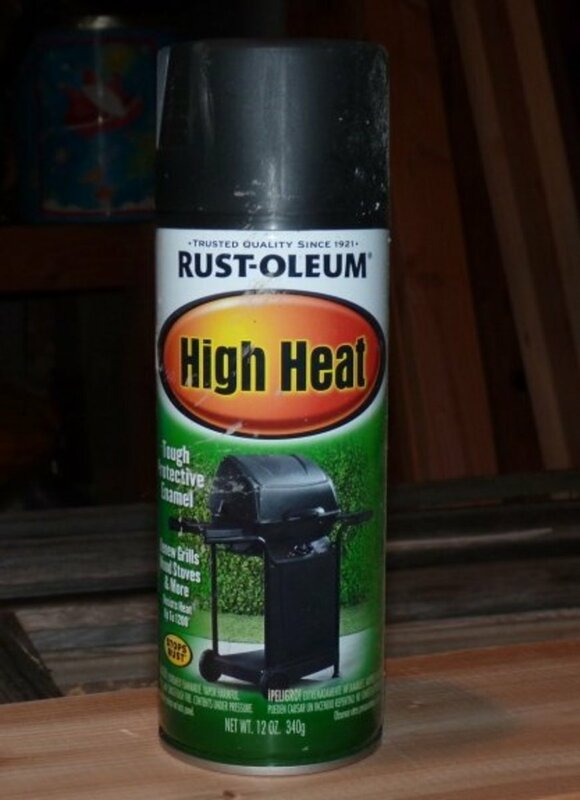 This saved me some money in material cost and left an area around the wood stove that will not scorch if hot embers fall to the floor. I laid out 2x4 stringers on the concrete with the 4" side flat on the floor, about 2 feet apart. I then filled the space between with 1" foil-backed rigid foam, foil side up. Again, I used 5/4" cedar deck planking and laid the planks before I attached them. 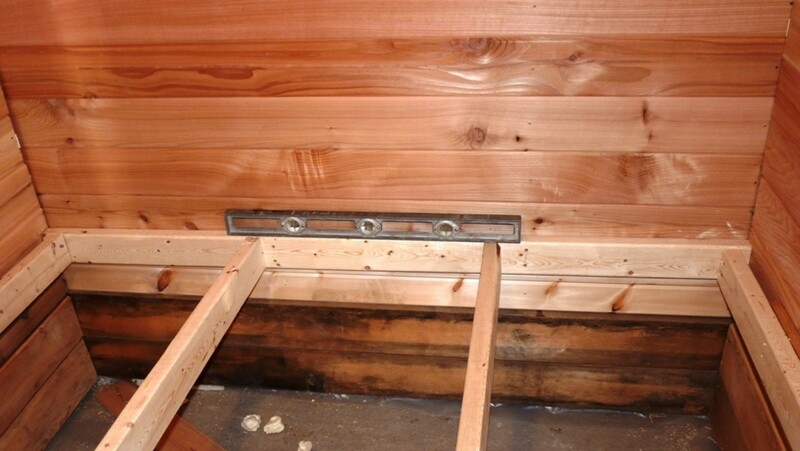 I placed 2 pieces of 1/4" paneling scraps as temporary spacers between the planks as I attached them with coated deck screws to the stringers. This was to ensure that the boards stayed parallel. I constructed a door and a handle latch. 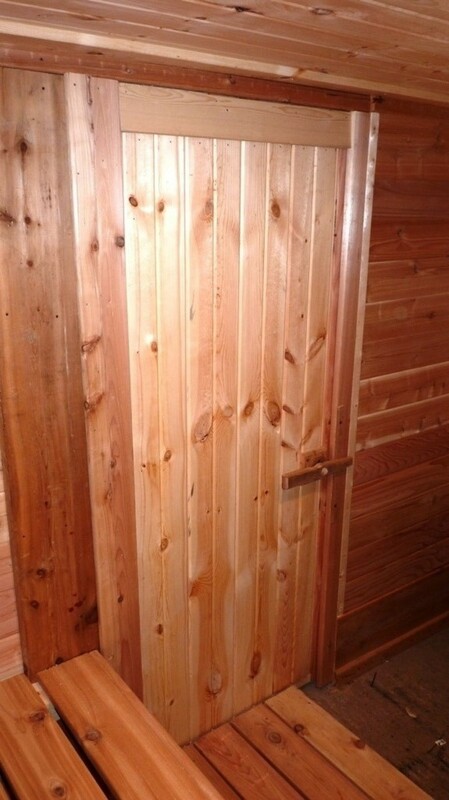 Almost finished with the sauna room, I had to make an insulated door. 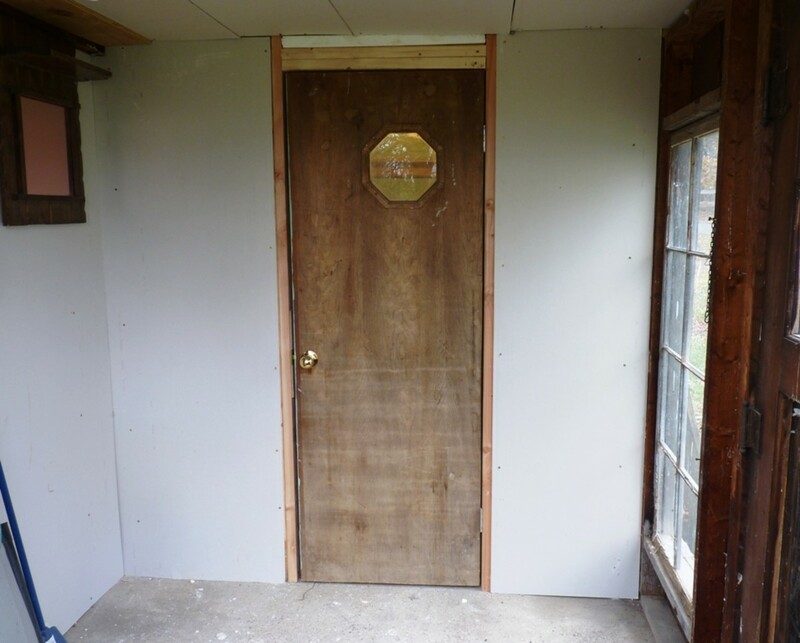 I built a 2x4 frame to fit the door opening with 1/2" clearance all around. Before constructing the complete door, I test fitted the frame in the opening and increased the clearance because of the slight irregularity of the opening. 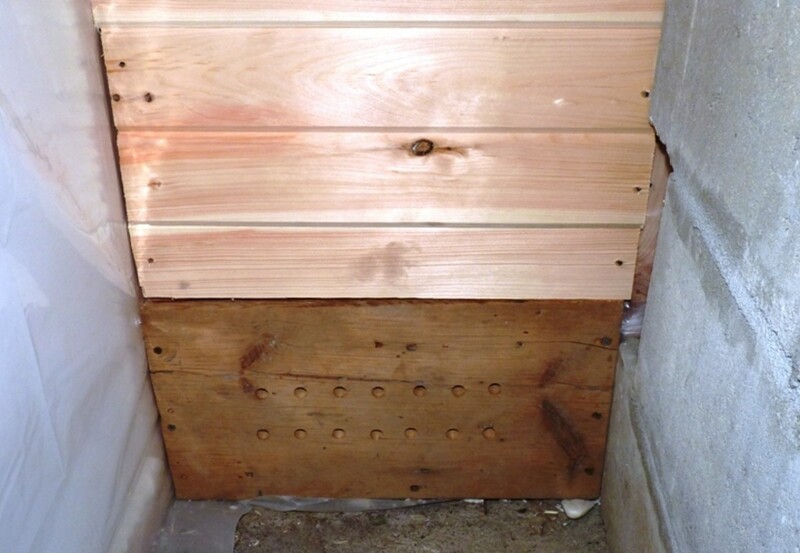 I added a nailer inside the frame for paneling attachment which had a width calculated to allow 2" of rigid Styrofoam insulation, car siding panels, and scrap cedar plywood to nest inside the frame. The panels were attached with galvanized nails. 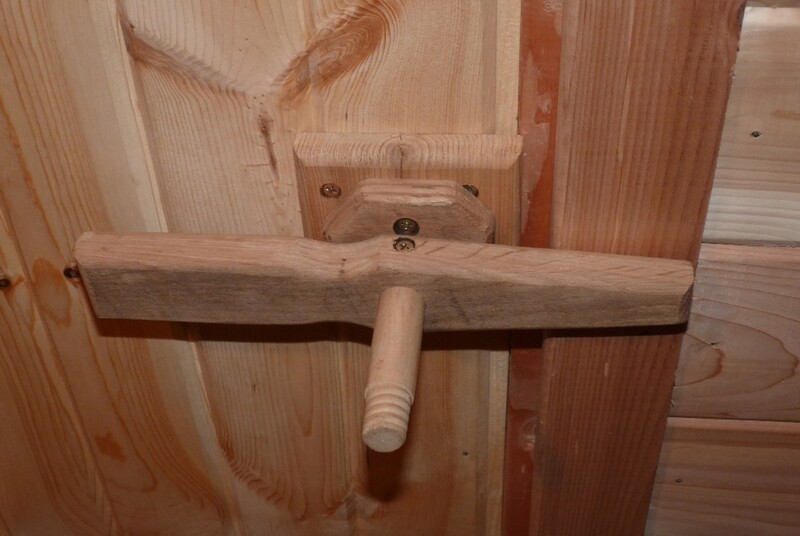 I created a contraption of a door handle/latch constructed for salvaged 1x6 oak fence boards. 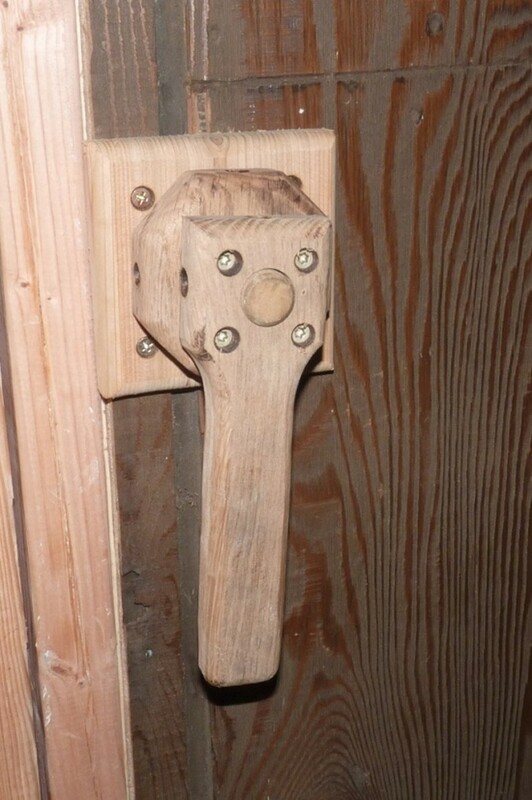 The exterior handle attached to a 1" dowel and to an interior latching/handle piece placed perpendicular to the outside handle. The clearance hole cut through the door was the same diameter as the dowel. I sanded the dowel until it fitted snuggly, then coated it with candle wax. 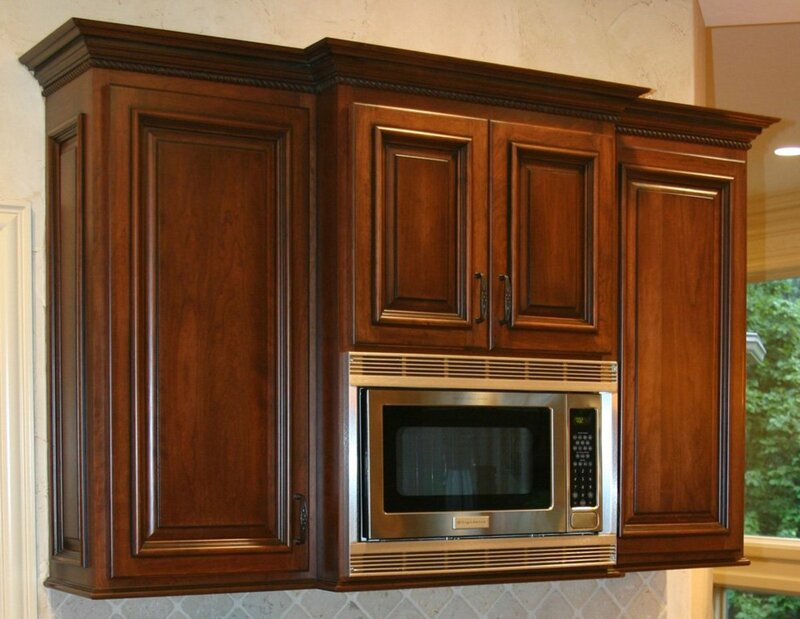 The interior handle/latch was designed to rotate over the door frame to hold it in place. I added a thin piece of oak to the door frame for the latch to slide on, hoping to reduce wear on the pine door frame. The door was assembled and the handle/latch worked great. Entry to the changing room. Entry to the hot room. 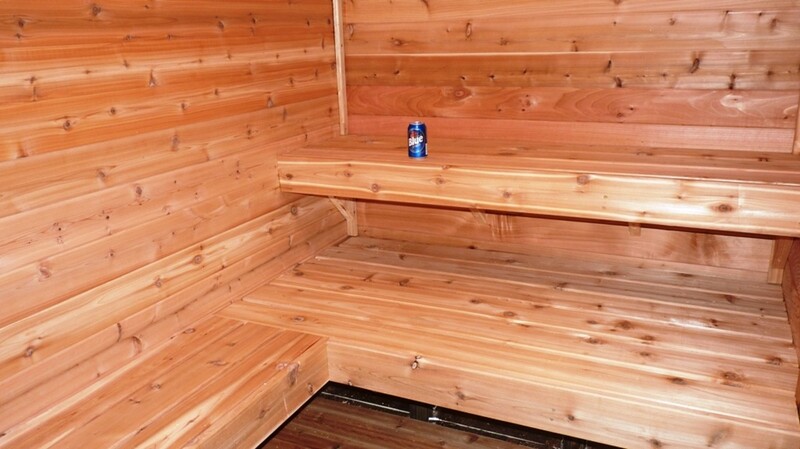 Once I had added trim pieces to the inside, the sauna was finally ready to fire up. Shortly after, I added a changing room and entrance. 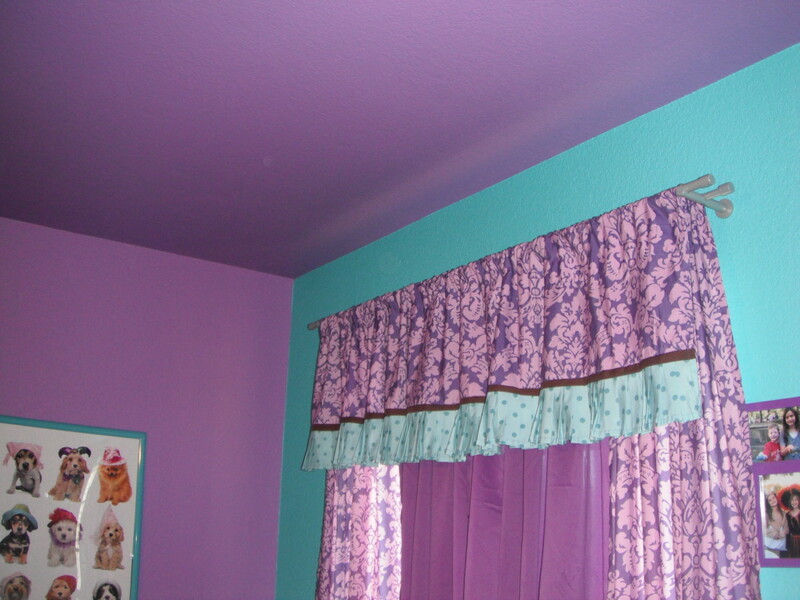 I still intend to add some finishing touches like a floor and ceiling paint, door trim, etc.. Enjoy! how does having no rocks to pour water to create steam affect the Sauna? It does have rocks but the don't get hot enough to immediately make steam. It just increases the humidity level as does the pan of water I have on the stove. It's a dry sauna anyway. its more of a dry sauna, but I put a steel bowl full of water on the stove for a little humidity. How do you produce your steam, specifically? Sorry, it's there now. I've been through a lot of build sites, didn't get a chance to list them all on my page, but have just added yours. Thanks for checking out my blog. 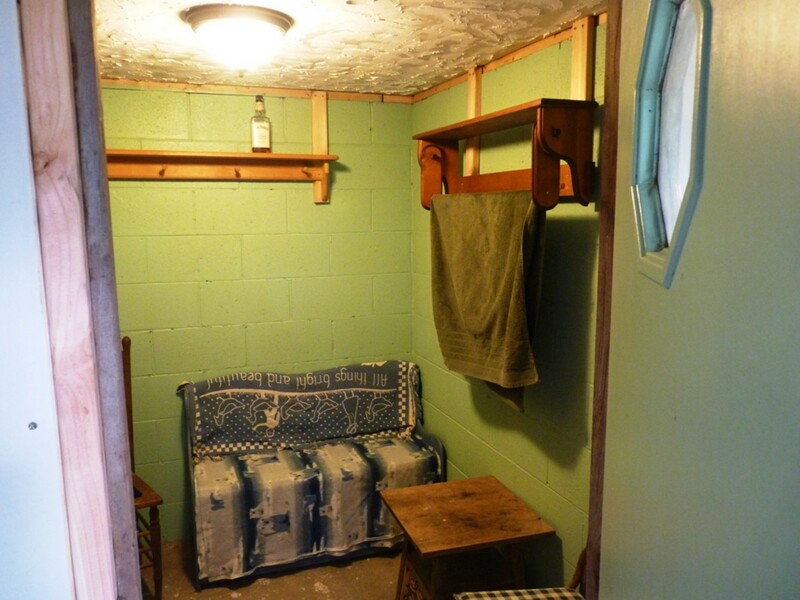 It's even fun using the sauna now in warm weather with the outdoor shower that we built. Thanks for reading. I checked out your blog. 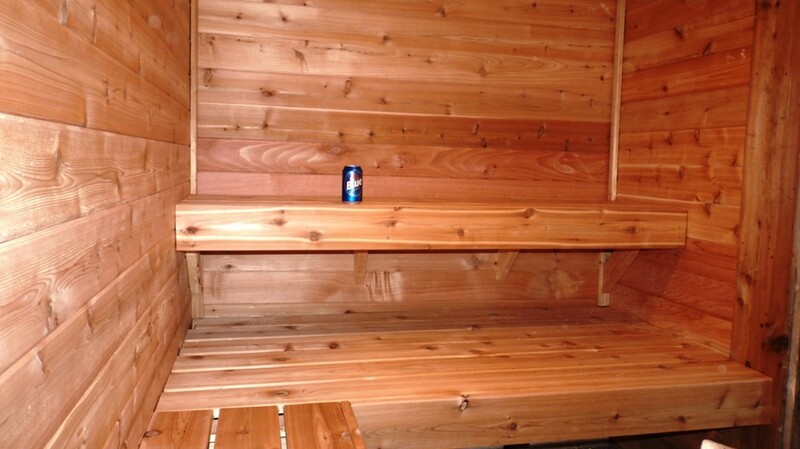 Looks like a nice sauna, I'm sure you'll enjoy it just as I have enjoyed mine. I noticed you didn't include my stuff in your list of useful links.